Born on 3 July 1731, in Windham, New London, Connecticut, Samuel Huntington was the son of Nathaniel and Mehetabel (Thurston) Huntington. He was the fourth of ten children and the second son in the family. 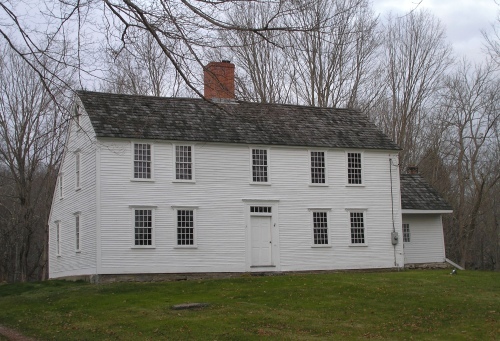 Nathaniel was a farmer and clothier at Scotland, Connecticut, and built a home there in 1732 that still stands to this day. Young Samuel did not acquire a formal education, except that provided by the “common schools.” At age 16 Samuel was apprenticed to a cooper, although he continued to help his father on the farm. Interested in learning, Samuel borrowed books from the library of the Rev. Ebenezer Devotion and from local lawyers, and began to study history, Latin and the law. He was admitted to the bar at Windham in 1754 at the age 23, and moved to Norwich, Connecticut to begin his practice. At the age of 29, Samuel Huntington married Martha Devotion on April 17, 1761. She was the daughter of the Rev. Ebenezer Devotion and Martha Lothrop in Norwich. The couple remained together until she died on June 3, 1794, in Norwich. They had no children of their own, but when the Rev. Joseph Huntington, the brother of Samuel, died, they adopted and raised his two children: the nephew, Samuel H. Huntington, who became Governor of Ohio in 1810, and the niece, Frances Huntington, who married the Rev. Edward Door Griffin, a President of Williams College. Samuel Huntington was elected by the Norwich leaders to be one of their representatives to the Connecticut Assembly in 1764. Huntington was returned to that office each year for the next ten years until 1774. Samuel made a very fine presence, and was named by the then Royal Governor, Jonathan Trumbull, as King’s Attorney in 1765. Huntington remained in that office until 1774, at which time Governor Trumbull appointed him to the Connecticut Superior Court. The position of justice on the Superior Court carried with it a seat on the Governor’s Council, which served as an upper legislative house to the Connecticut Assembly. Huntington held this office until 1778, at which time he was named Chief Justice. Meanwhile, as the difficulties with Britain deepened, Huntington spoke out against the Coercive Acts of Parliament. His views on the emerging crisis agreed with the majority of the Members of the Connecticut Assembly, and they elected him in October 1775 to become one of the delegates to the Second Continental Congress. He presented his credentials and took his place in Philadelphia in January 1776. Samuel Huntington was present on June 7, 1776 when Richard Henry Lee of Virginia proposed a resolution that “These colonies are and of right ought to be free and independent states.” The matter was tabled until brought back to the floor on July 2, 1776 at which time Huntington voted for the resolution, and also for the language in the Declaration on July 4th. He signed the engrossed copy of the Declaration on August 2, 1776. Samuel Huntington continued as a delegate to the Continental Congress from Connecticut, being returned by the Assembly each year through 1781. Serving on several committees during his years in the Congress, Huntington was always supportive of encouraging the states to fully comply with levies for men, supplies and money. Not an alarmist, nor a defeatist, Huntington was a steady, faithful, calm patriot, well respected and admired by his colleagues. His steady hand helped keep the Congress together as the infant nation faced military reverses in the field, following the euphoria of the surrender of the British Army under General Burgoyne at Saratoga on October 17, 1777. When John Jay was named minister plenipotentiary to the Court of Spain, and thus had to vacate the office of President of the Continental Congress, Samuel Huntington was elected President of that body on September 28, 1779. That election technically makes Samuel Huntington America’s first President. Samuel On the 28th of September, in 1779, he was elected President of America’s Continental Congress. How could that be? Because when the new country adopted its Articles of Confederation, in 1781, Huntington was still President of the Continental Congress. That also made him the President of the country. A man of cautious, reticent, and conservative temperament, he nevertheless joined the Sons of Liberty in opposition to the Stamp Act, although he was hesitant about further strong protests. The passage of the Coercive Acts in 1774 to protest the Boston Tea Party brought many moderates, including Huntington, into a more active role. Throughout the Revolution he served both in Congress and the Connecticut upper house. On July 4, 1776, he was one of Connecticut’s signers of the Declaration of Independence. The esteem with which he was held by Congress was evidenced by his election in 1779 to the first of two terms as president of the Continental Congress. While he was president in 1781, the Articles of Confederation went into effect, thus making him the first president of the United States. He served in this office during a dark period of severe economic problems and terrible military defeats, including the loss of Charleston, South Carolina. As President of the Continental Congress, his accomplishments as President were significant. One of the most difficult problems facing the young nation was the principle of unity The Articles of Confederation and Perpetual Union had been debated, modified, and adopted by the Congress in 1777. All the states had ratified this document at the time of Huntington’s Presidency, except Maryland. The objection Maryland had with the Articles was the issue of western lands, particularly in the Ohio country, which were held by several states. Huntington sat down with the leaders of the states of New York, Virginia and Connecticut to convince them that holding onto such feeble grants from a King, now no longer in power, was absurd and therefore, should be ceded over to the national government. Slowly each state became convinced that this was in the best interests of the new nation at large, and did cede these lands. Maryland then agreed, and ratified the Articles on March 1, 1781. In this image we see Samuel Huntington as he appeared in 1783. The portrait was painted by Charles Willson Peale in 1783. In later years he saw the transition of Connecticut into a U.S. State. He resolved the issue of a permanent state capital at Hartford and oversaw the construction of the state house. He died while in office, at his home in Norwich on January 5, 1796. His tomb, which was extensively restored and renovated in a 2003 project, is located in the Old Norwichtown Cemetery behind his mansion house. Both Samuel and his wife Martha’s remains were disinterred during the course of the project and then reinterred in a formal ceremony on November 23, 2003.Between 1786 and 1796, he served as Governor of Connecticut. He was still Governor when he died at the age of 64. This entry was posted in American History, British history, buildings and structures, Declaration of Independence, Great Britain and tagged American history, British history, Connecticut, Declaration of Independence, Samuel Huntington, signer of the Declaration of Independence. Bookmark the permalink. I thought I knew my American history, but this series has opened my eyes to the “hidden” history – that omitted from the textbooks. Seems like I’m the biggest fan of this series Regina, I find it absolutely fascinating and I think that there should be a much bigger fan base in the good ol’ USofA, It appears to me that for all the talk and shows of patriotism in the States there seems a remarable lack of real interest in it’s deep history, and it is history I think that defines us as people. I recall when I went to Philly to see the ‘Bell’, there were more non American voices amongst the crowd than Americans. I’d have thought a visit to ‘Philadelphia and the Bell’ would have been to Americans what Mecca is to the good people of Islam (and I think there are many more good than evil). Here endeth the lesson for today as the Vicar is wont to say in the C of E.